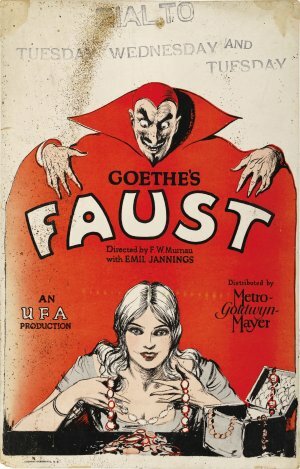 Until METROPOLIS a year later, this epic silent Expressionist retelling of FAUST from director F.W. ‘NOSFERATU’ Murnau was the most expensive film made by Germany’s Ufa Studio. In its production design and stunning special effects, the money was well-spent and is all there on screen supporting a superb and moving production. 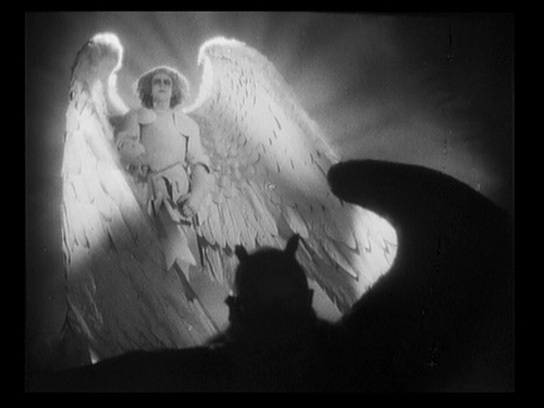 The prologue is a bargain made across an elaborate and expensive vista between the demonic Mephisto (a wonderfully exuberant Emil Jannings) and a glowing, virtuous Archangel (Werner Fuetterer) over how easy it would be to corrupt a righteous man. The prize is control of Earth below them. On our level, Gösta Ekman, a highly-acclaimed Swedish stage actor, plays the aged (and later youthful) alchemist Faust, disguising his famous matinee-idol looks at the beginning under the Moses-like abundant white hair and flowing beard. He is in dire needs of a way to save his people from a terrible plague and comes across an occult solution which advises going to a cross-roads and summoning the devil three times by name. Desperate times calls for desperate measures and he does so in a strikingly-mounted invocation scene calling up ascending rings of infernal fire around him that clearly echo the creation of both THE GOLEM and Maria in METROPOLIS. Mephisto at first appears in seemingly unassuming guise as a peasant tipping his hat nonchalantly in greeting, but with eyes that glow to brilliant eerie effect in the dark, recalling John Carpenter’s pirates in THE FOG (1980). Faust is tempted by Mephisto with a bargain to sell his soul in return for untold powers. Faust has the decency and caution not to be reeled in immediately. It is then that Mephisto succeeds with the pusher’s free taster offer of a twenty-four hour trial if he signs. After the hour-glass runs out, his ‘money back’ is the cancellation of the pact. This seals the deal as a great no-risk persuader to Faust who signs. To test his supernatural abilities, the elderly sorcerer goes out to find that he can heal the sick instantly. However, the villagers fear the devil in his sudden power and shout for him to be stoned - there’s gratitude for you. He flees back to his study, where Mephisto, now a traditional black silk-garbed leering demon, tempts him even further to ask for a return to youth. No sooner said than done and after a scorching burst of flames Faust the old becomes the handsome young version, like a Renaissance prince. He and Mephisto embark on a tempestuous flight across skies of silhouetted vultures to Italy, where they gate-crash the wedding of the Duchess of Parma, the most beautiful woman in Italy. While the demon flatters the Duchess with a huge display of elephants and dancers, Faust feels his oats and hers by absconding with her, much to the chagrin of her new husband who earns a fatal stabbing from Mephisto for defending their mutual honours. With dreadfully influential timing, the hour-glass runs out and with it Faust’s bargain…unless he would like to carry on the bargain? Fatally, with such intoxicating attractions to play for, the rejuvenated youth agrees. We then see Faust some time later, perched in heavy Hamlet-style contemplation upon a rock. Mephisto does not understand why he is unhappy: “…from indulgence to indulgence, sensation without end, and yet nothing satisfies you!” Faust is homesick and orders the demon to return him to his village. There he falls in love with the lovely, innocent Gretchen (Camilla Horn), helped into sharing Faust’s love by an evil charm necklace of Mephisto. The little devil also reveals a marvellous comedic streak in Jannings amid the heavyweight drama. In buttering up her avaricious dragon of a mother, he is visibly repelled by her breath as well as the saintly hymn-singing of the church choir. Solemnity crashes in when Faust decides to aim for a happy ending with Gretchen. In trying to wickedly keep him on the opposite of the straight and narrow (crooked and wide? ), Mephisto rouses the mother who dies from the shock of seeing this demon again. Faust is ratted out to Gretchen’s soldier brother Valentin by Mephisto, who kills Valentin, framing Gretchen as a harlot as well as Faust for the murder. Gretchen then begins a cruel, tortuous time as she is shunned by society everywhere she goes while she tries to care for her resulting new-born baby. A delirious vision of a warm cradle causes her to tragically put her baby down in the snow. The child’s death causes the locals to apprehend her and she is jailed pending death by burning at the stake. On witnessing this, Faust pleads with Mephisto that he wishes he had never had youth. The devil takes this as another order and while Faust struggles through the crowd to her, he reverts Faust to the elder version of before. She does not recognise this old man, yet as the executing flames consume her, Faust nobly joins her, whereupon his face is transformed into the young man she knew. They are reunited in very poignant joy, the heightened tension somehow eased by the fire purifying and blending the young lovers once more. Up in Heaven, the Archangel, clearly appalled by Mephisto’s ugly gloating at his victory, rewards him with the news that he lost the bet as he could not overcome “the Word” that triumphed no matter how the humans were tested – and that wors is ‘love’.